Blog Is our aging clock in the hypothalamus? 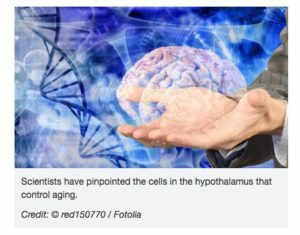 Is our aging clock in the hypothalamus? There has been increasing interest in the hypothalamus as the central time keeper of our aging. Click here for an exciting article explaining aging as a function of hypothalamic decline. This year’s Nobel Prize in Medicine and Physiology was awarded to three scientists who studied the Circadian rhythm, or the body’s internal clock. Olovnikov believes that because the light exposure of the pineal gland and a possible gravitational lunar sensor, our hypothalamus can keep track of the months that we have lived. This is mediated by theoretical structures he calls DNA chronomeres and printomeres that are kept within the cells of the hypothalamus and keep track of the number of “moons” that we have lived. This internal clock is what accounts for the gradual decay in general function that is driven by hypothalamic dysfunction. Chronographic theory of development, aging, and origin of cancer: role of chronomeres and printomeres. As for theories of science, I would not bet against this man’s imagination. As the Tesla’s, Newton’s, and Galileo’s have shown us, true advancement in science is often creative, inductive, and revolutionary rather than logical, deductive, and gradual. Hi. Very interesting. May melatonin help?